Three super active ideas for learning sight words in our ABCs and 123s letter and numbers series today, as we’re joined by Tina from Simple Fun for Kids. 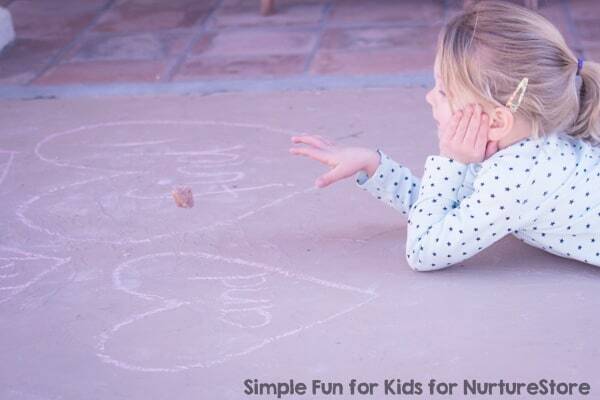 Is your kindergartner learning sight words and getting bored and discouraged with flash cards? 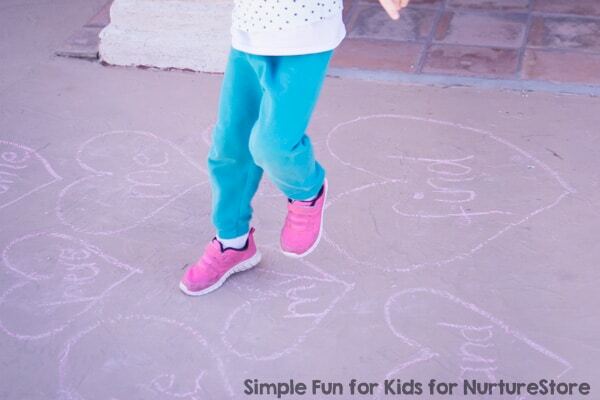 Try these 3 Gross Motor Activities for Learning Sight Words instead! Not only is it more fun to be moving while learning, it’s also scientifically proven that more information is retained this way! 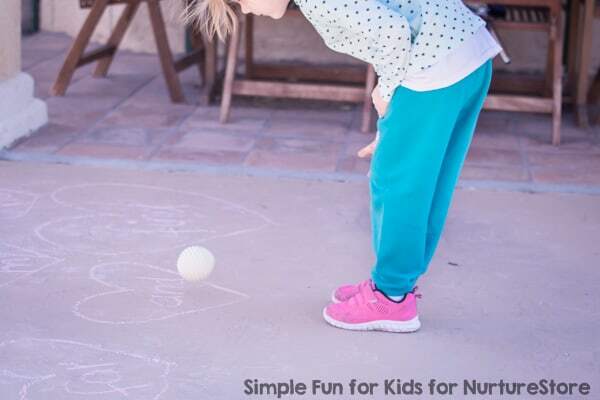 These gross motor activities are all very simple and only take a piece of chalk and a few minutes to set up. If you’re working on other areas, like letters, numbers or math facts, you can easily adapt these activities to your learning goals. 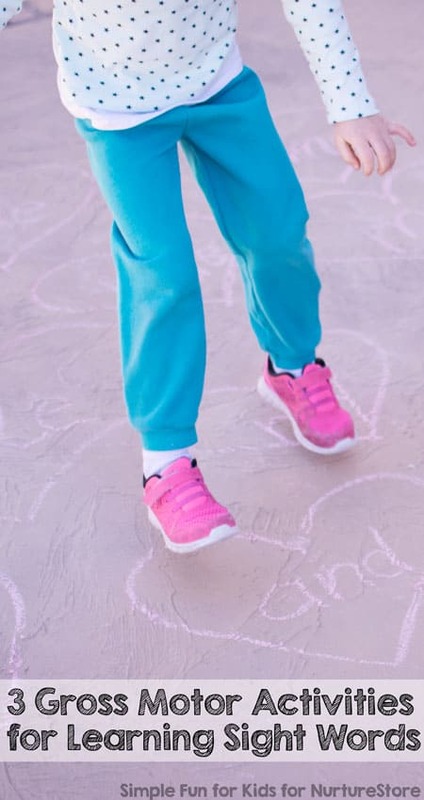 I prepared this activity by writing a selection of sight words on the concrete in our backyard. Driveways and quiet sidewalks work well, too. For a nicer touch, I drew a heart around each sight word, but that’s optional. You could use different shapes for different words if your child needs a little more help remembering them. We started out by just walking over the words and reading them out loud. E has most of them pretty much down, but some can still be a little tricky. For that reason, I made sure to include both “me” and “my”, and she worked on telling them apart throughout our activity. The first way E worked on sight word recognition (and my original idea when I set up this activity) was by jumping to the sight words I called out. She alternated between jumping with both feet and jumping with one foot. After a few minutes, we switched it up a little, and she called out her own targets. After E had gotten tired of jumping, I saw a small ball that was lying nearby and suggested she throw it at the sight words I called out. She tried this version for a while, but she didn’t like the fact that the ball would bounce away from the words, no matter what she did. E liked this a lot better than the ball toss: We collected a bunch of pinecones from around the backyard and lined them up about 15 yards away from where I’d written the sight words. She’d pick up one of the pinecones and run as fast as she could to the sight word I called out and place the pinecone in the heart. After that, she’d run back as fast as she could for the next pinecone. 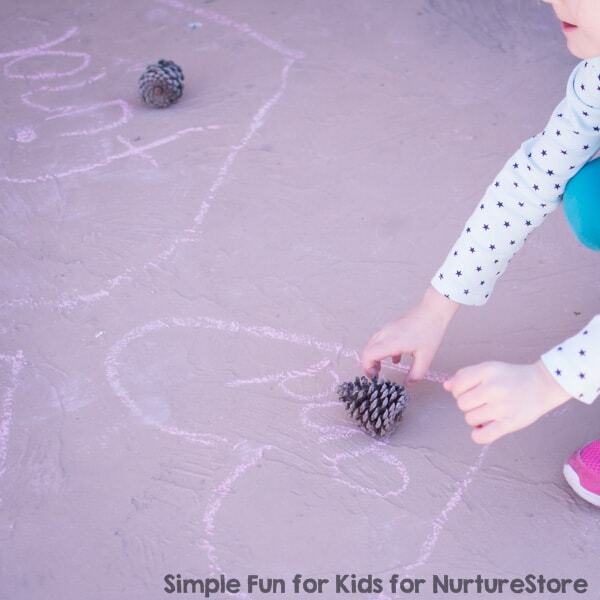 We did this until all the sight words were marked with pinecones – and then E decided to reverse the process: She read a word, picked up the corresponding pinecone, and raced it back to the starting line. Hi, I’m Tina! I have a toddler and a preschooler, and I blog at Simple Fun for Kids where I share printables and simple ideas for crafts, sensory, science, and art activities for kindergartners, preschoolers, toddlers, and babies. We’re from Germany but currently live in Texas. Come on over to get to know my kids, my blog, and me better!